IS HELO DEVICE A SCAM? | HELO WRISTBAND REVIEWS! What is HELO LX Health Device? Helo LX is a #wearable #healthtracker that fits over your #wrist. minimalistic interface and an adjustable band. #HeloLX focuses on tracking the activity of your heart. It uses a specific frequency (125 Hz) to track your cardiovascular health (compared to the 35Hz on the original Helo). Specific things tracked by the Helo LX include blood pressure, ECG, heart rate, breath rate, mood, and fatigue. You can also do a “Heart Check” to assess the overall health of your heart. 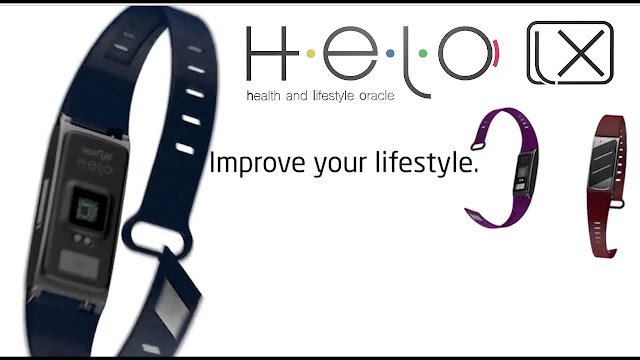 The Helo LX wearable was launched in December 2016 by American multilevel marketing company World Media & Technology Corp (which also calls itself “Wor(l)d”. The company claims to have projected sales of 1 million Helo units worldwide. Helo LX was introduced at CES 2017 in Las Vegas. The company describes its LX model as “the luxury version of Helo”. activity tracker. Keep reading to find out if it’s worth your money. How Does Helo LX Work? Helo LX is powered by the Toshiba ApP lite processor, which is the same processor found in the original Helo. The processor analyzes data collected by a light sensor, then tracks that data over time to learn more about you. Meanwhile, Helo LX tracks your heartbeat in beats per minute. Each measurement lasts 40 seconds. You’ll need to keep your wrist still for the duration of the measurement – so this isn’t a constant on-demand heart rate tracking system. Similarly, the breath rate measurement takes 40 seconds and is completed by monitoring your wrist. What about your mood and energy? How does Helo LX track these things? Well, Helo LX’s processor will run all your physiological data through its algorithms to make assumptions about your mood and energy. Again, this scan takes 40 seconds, during which you’ll need to remain motionless. original Helo used a 35Hz frequency, while the LX uses the 125Hz frequency. Wor(l)d claims this leads to better accuracy in cardiovascular measurements. the Bottom: The ECG plate has been reduced and optimized. The LX model uses a new charger with a magnetic connection. Materials: The LX features 99.999% pure germanium stone on titanium plates. Purple Red, Royal Blue, and Light Blue. The wearable is currently only available to preorder. Estimated shipping is March 2017. Despite the high price of Helo LX, the app is not included with your purchase. You’ll need to pay a steep monthly subscription fee to use the app and enjoy the full features of Helo LX. Helo has a “free” version of its app, although it has extremely basic functionality and it expires after 30 days. Once your trial period is over, you’ll need to sign up for the “Helo Pro Plan”. The Helo Pro Plan gives you unlimited recording time, support for 20 people on your WeCare plan, 3 people on your SOS plan, and Guardian / LifeOracle support. The Helo Pro Plan is priced at $12 USD per month. Wor(l)d has an average return policy. You can return your Helo LX within 15 days of delivery for any reason. Beyond that initial 15 day period, returns are only accepted on unused, original-condition products. About World Media & Technology Corp.
World Media & Technology Corp, which also does business under the name “Wor(l)d” is a multilevel marketing company founded in 2011. The company is led by CEO Fabio Galdi. were not released – although the company claims to have ordered 300,000 ApP Lite processors from Toshiba in the last 6 months. Wor(l)d is headquartered in Miami and maintains 15 offices worldwide. The company was founded in 2011. Essentially, Wor(l)d is an MLM that has chosen to focus on the wearable niche. lacks basic features found on other wearables (like waterproofing and fitness tracking). Today, you can find powerful heart rate trackers for under $200 available online. These wrist-based monitors continuously monitor your heart rate during activities – whether you’re exercising or sitting on the couch. With Helo LX, on the other hand, you have to hold your wrist still for 40 (!) seconds while the device tracks your pulse. You can take a faster measurement using your fingers. For all of these reasons, Helo LX doesn’t appear to be worth the money in a wearable market that’s already too crowded. a wearable device that aims to improve on the original Helo. Find out if Helo LX is worth the price today in our review.